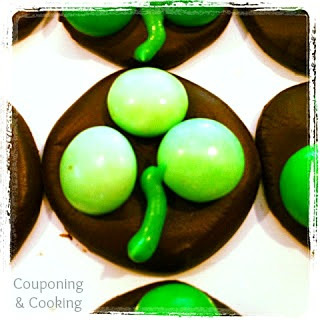 Tobins' Tastes: Dark Chocolate Shamrock Candies- Pinterest Fail! So I was all excited to try and make these adorable Shamrock Treats I saw on Pinterest awhile back. They were reminiscent of my Christmas Pinterest Pretzel Bites and I thought they would be a perfect treat to serve at our St. Patrick's Day party this past weekend. I figured it would be so easy. I had the pretzels; I had the chocolate. All I needed was plain green M&M's. Easy right? So wrong. I searched everywhere for those babies and they were no where to be found. The only thing I could find even remotely close to them was the below Mint M&M's. One problem, mint and pretzels don't really go together. So I improvised. And while my final product didn't end up like I had planned it was pretty darn cute and really delicious. Everyone loved them. That is why I love Pinterest. You can start with someone's great idea and turn it into your own little twist of a version. This is a Pinspired treat that really did give me the inspiration to do something of my own, not just copy exactly what someone else did. So while it might have been a Pinterest fail due to my poor planning, it was a culinary success in my opinion. 1.) Bake dark chocolate candies at 200 degrees for 2-3 minutes on a baking tray covered in wax or parchment paper. 2.) 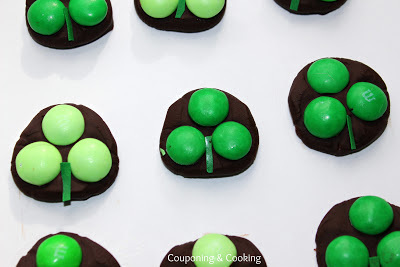 While they were in the oven I made the M&M's into shamrock shaped groups of three to make it quicker and easier to place them on the chocolates while the chocolate was still warm. 3.) 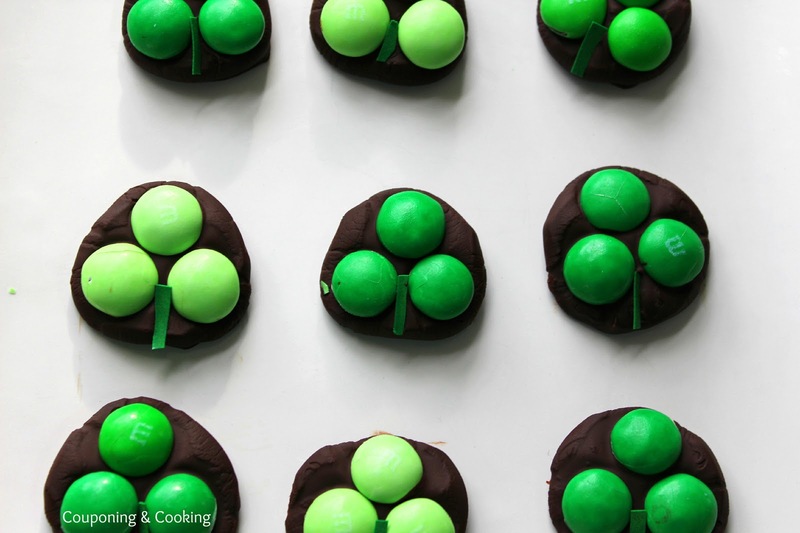 Press M&M's into the tops of the melted chocolate to resemble a shamrock. 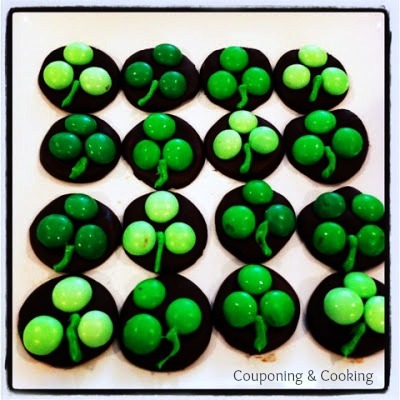 I mostly did "three leafed" ones as the "four leaf clovers" were a little tough to get the M&M's to stay on the chocolate without sliding off. 4.) Place tray in fridge or freezer to allow the candies to firm up. 5.) Peel hardened candies off the wax paper and use icing to add a little stem. These are best stored in the fridge or freezer and eaten within 48 hours of making them. Enjoy! Mint M&Ms? YUM! And yours looks fantastic! they are super cute and I bet soooo yummy! Anyhing mint is a win in my book. Cute! I didn't know there were mint M&Ms. Probably a good thing LOL! Would love to have you share these for our Green Food link-up! What did the mint m and m's end up running your price wise including gas for running around looking for them? This is one problem I always run into. SOOO cute! I'd love to have you link this up to my party at http://scrapbookingez.blogspot.com/2012/03/anything-goes-linky-party_15.html if you get a chance. Thanks for sharing! Looks delicious and adorable. I'll have to keep it in mind for next year. Very easy and yummy looking! I would never let them last 48 hours, lol. They look great. Thanks for sharing at our party this week. So cute!! I didn't know they made Mint M & M's. Where did you find them?? Thanks for sharing at Thursday's Temptation. I actually found them at Walmart of all places : ) They also had them in a dark chocolate raspberry flavor too. Those are great! What an easy and delicious treat. I think these look fantastic!! And I love mint M&M's! Thanks for sharing at oopsey daisy! They look great and sound better than the pretzel treat you mentioned! 48 hours to consume them...haha...they would have been gone in 48 minutes at my house! :) Thanks for sharing at the Rock 'N Share. So cute! I wish I had seen these last week for my kids. Making a note for next year! So cute! Saving for next year! Thanks for linking up! Stop by tomorrow and link up again!